Our tour was at 2pm but we arrived a few hours early so we could check out the area. Our first stop was the visitors center to see if we could find a natural area nearby. We were in luck, there was a stream just a few minutes away where we could hang out and have some lunch. So peaceful! We found our way to the one public restroom, strange piece of information to know about Point Reyes, before making our way to Cowgirl Creamery. When we arrived, I was so excited about the prospect of learning new cheese information! There were even large windows where you could watch the cheese production but they were just wrapping up for the day. There were probably about 20 guests there for the tour and we all gathered at a large table. I guess the term “tour” is used loosely because we spent the whole time at this table. It did make sense though since we had demonstrations and cheese tasting. Cheryl was our hostess and she started by giving us some history of the company. Cowgirl Creamery has been in business for 19 years and this was the site where all the cheese was originally made. They have since expanded into a facility in Petaluma and now only one cheese is being made there. I made note about the bathroom before but it is strangely relevant because of the water restrictions. Cheryl said that they recently had to make the choice between having a public restroom and making cheese there. Obviously they chose to make cheese! After the brief history, we had a cheesemaking demonstration. There were only a couple ingredients needed to make cheese curds: warm milk and a vegetarian coagulant. Although there is usually a “starter culture” added also for flavor. They added a large amount of coagulant for the visual effect. She told us they usually use even less than that for the giant vat in the back. It made it really easy for us to see the whey seeping up to get “away” from the curds. What a cool way to remember which part is the curd and which is the whey! Also she pointed out that type of cheese determines how big the curds should be. Fresh cheeses such as brie and camembert use large, wet curds. Cheeses that will be formed into a wheel, prefer smaller curds and use pressure to remove the whey. We even got to see 2 different molds with wet and small curds to illustrate the point! Super cool! 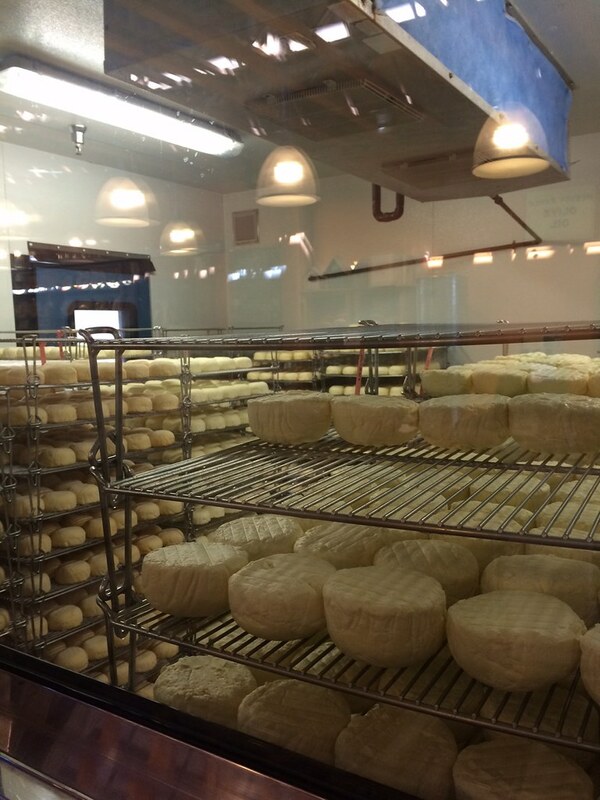 Cowgirl Creamery mainly creates fresh cheeses so the question of raw milk came up. US cheese law states that if raw milk is used, the cheese must age for 60 days minimum. 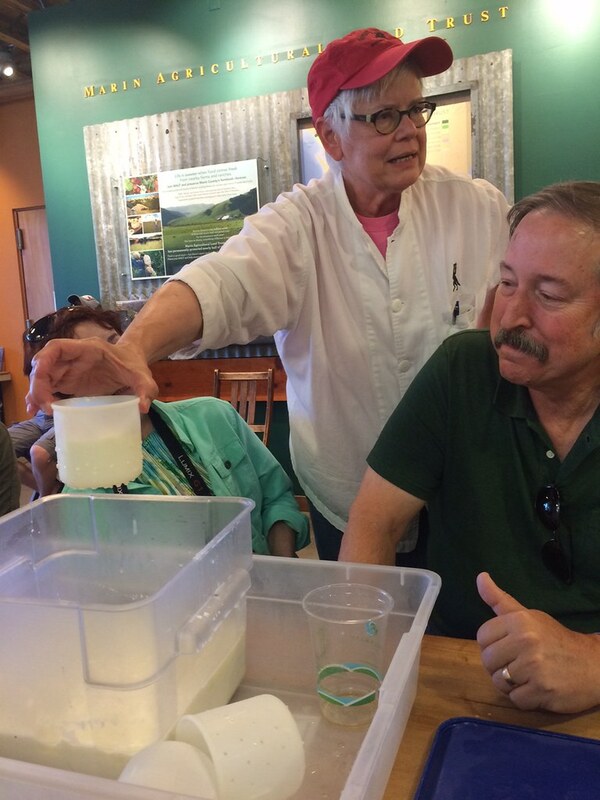 The owners, Peggy Smith and Sue Conley, decided they would use avoid this scenario by using pasteurized milk to create their fresh cheeses. Next was the cheese tasting. We had the opportunity to taste six cheeses that day and surprisingly the first five were all made with vegetarian coagulant (rennet). Great for all you vegetarians out there! 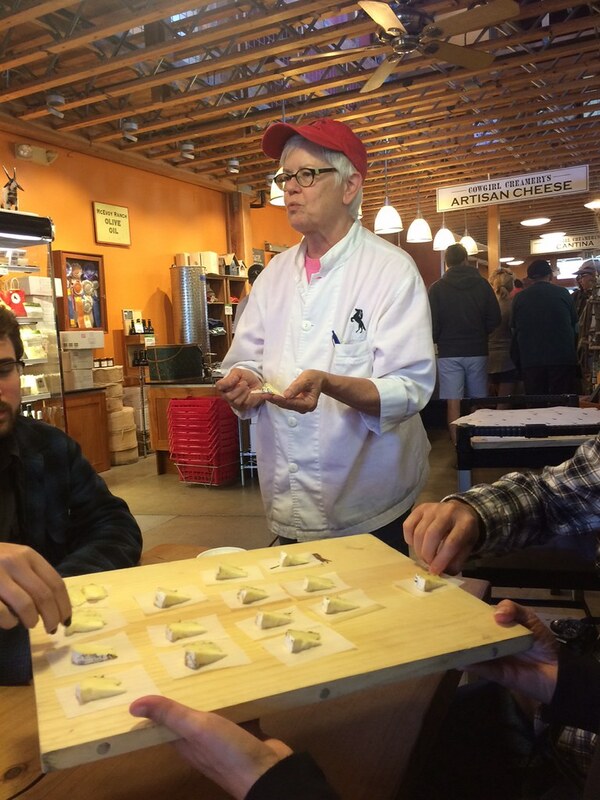 During the tasting, Cheryl told us so many suggestions for pairings with the cheeses. She also mentioned that many of them could be eaten for breakfast since European cultures have cheese with every meal. Although the Pierce Point and Red Hawk didn’t have pairings suggested, they had cool stories. Pierce Point is a cheese that is only made during a specific time of year. They have a few cheeses that fit into the “seasonal cheese” category and all of them are made from Jersey cow milk with a high butter fat content. The Red Hawk cheese was kind of discovered by mistake. Originally it was Mt Tam cheese but a mold grew on the outside and after it was washed with saline the rind turned pink. The reason a mold grew on the rind was due to a specific bacteria found in their seaside air. Red Hawk is the only cheese currently being made at this facility. Before finishing up the tasting and tour, we had time for a little more education. An artisan cheese is a type of cheese where the specific herd from a specific farm can be identified. 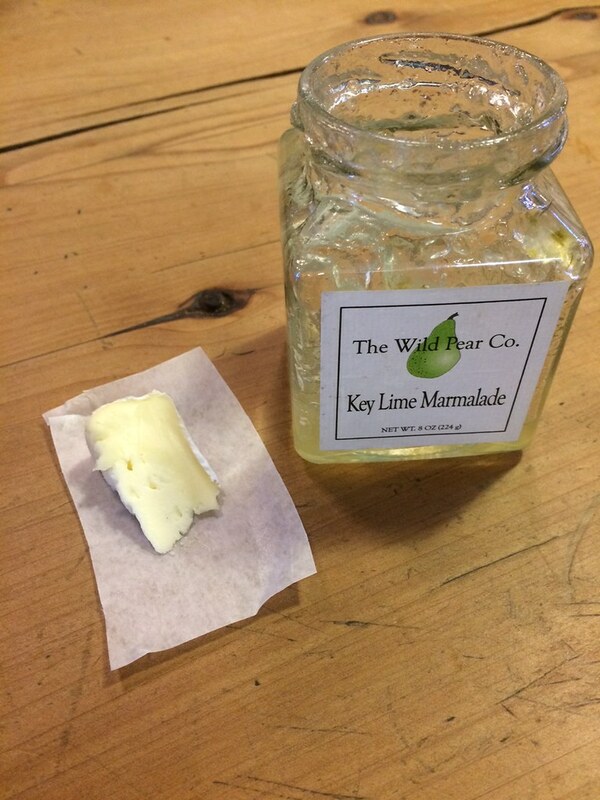 A farmstead cheese is one that is made on the actual farm where the animals live. It’s always so fun to add to our cheese vocabulary. We had such a great time tasting all the cheeses, the hard decision came when we had to choose what to take home. Since we are always planning for future WineAndCheeseFriday’s we thought of what wines we had at home waiting to have their turn in the spotlight. There was a cheddar that they sold at the counter that seemed like it would go great with one of the white wines we have. And we couldn’t go home without some Red Hawk after learning all about it’s cool story. You’ll just have to wait to see which wine gets paired with that! Thanks to Cheryl for such a fun experience, we can’t wait to taste all these cheeses again at home! 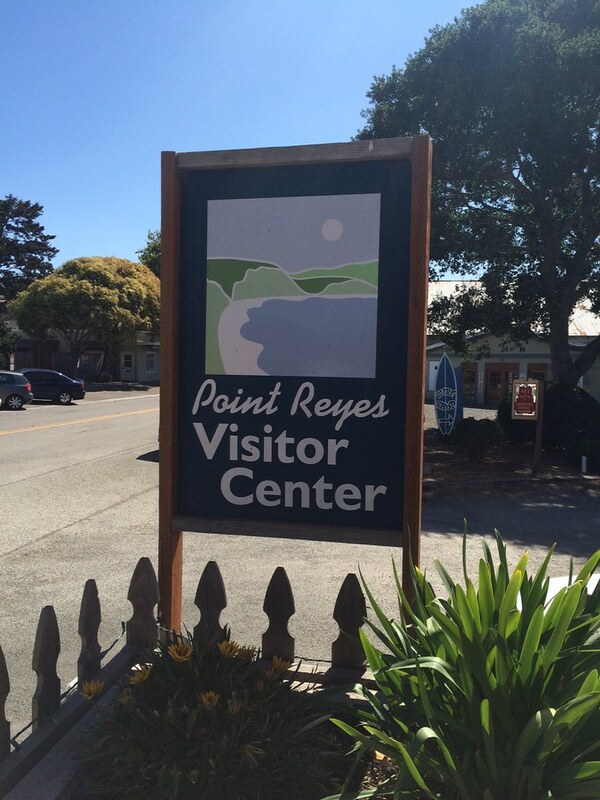 One other thing we had heard about Point Reyes was that there were some tasty local oysters. We couldn’t pass up that chance especially since neither of us have ever tasted oysters before. So our final stop of the day was Cafe Reyes. What a strange experience when we remembered that we ate in this exact restaurant when we first moved to California. 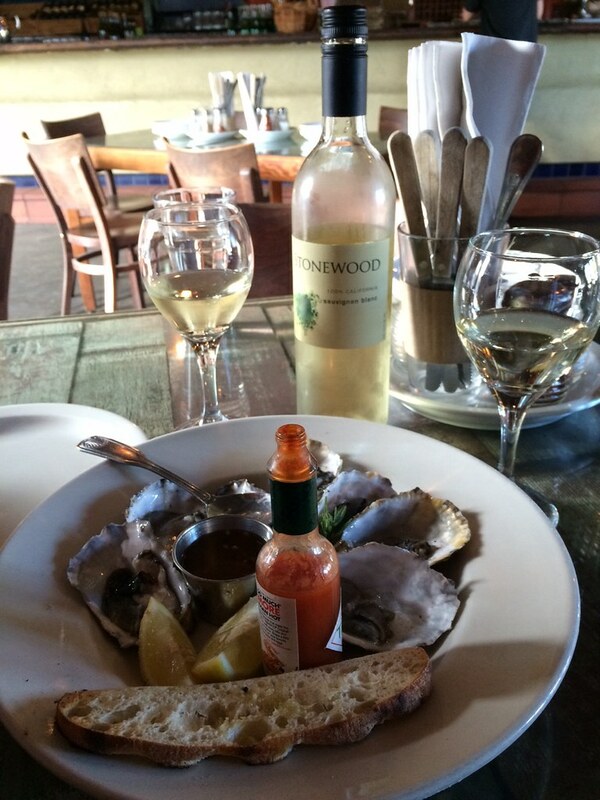 Neil picked out our meal of house Sauvignon Blanc, a half dozen oysters, and anchovy pizza. After tasting the oysters with and without sauces, I wouldn’t say that we will be eating them everyday but what a great chance to try them! And we really liked the pizza with anchovies, not bad at all. 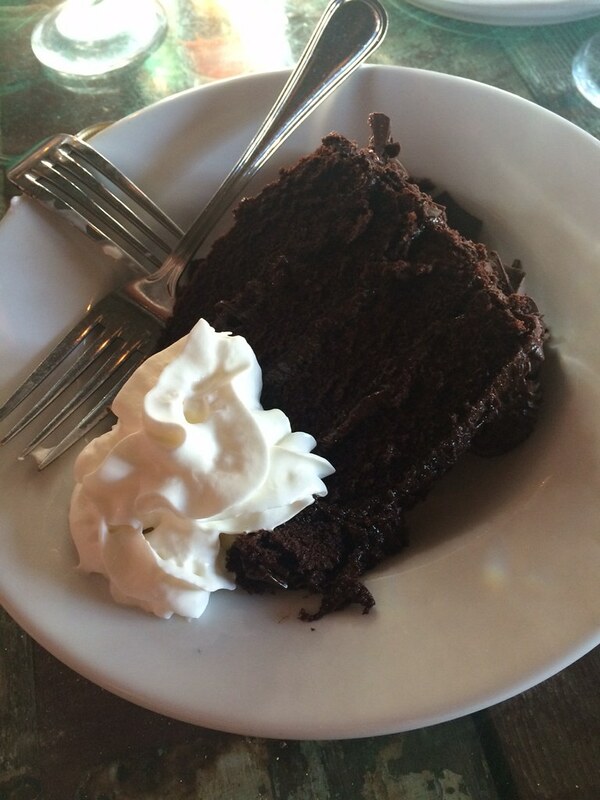 We even saved room for some chocolate cake. Delicious! We wrapped up the day by catching the bus, taking a nap, and arriving safely back in SF. What a great day!